Pure water creates a clean, spot-free finish on your vehicle! Water can be your vehicle's best friend and its worst enemy. Water is necessary to clean your vehicle but pesky water spots can really ruin a glossy paint finish. The culprit is not the water itself; rather it's all the minerals that exist within every drop of water. These minerals remain on the paint long after the water has evaporated and they etch permanent spots into the finish. Prevent water spots before they start with the Spot Free Water De-Ionizer Canister and Spot Free Water De-Ionizer Cartridge. Water naturally contains a long list of minerals and sediment that are not filtered out at the water treatment plant. If you have well water, then you've really got minerals in your water. 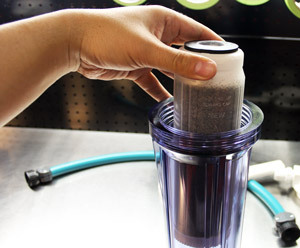 The Spot Free Water De-Ionizer Canister is a compact unit that attaches directly to your hose and removes unwanted minerals and sediment as the water passes through. 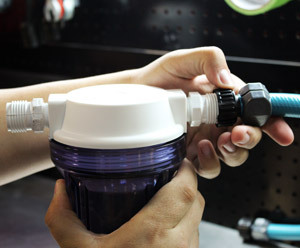 The Spot Free Water De-Ionizer Canister can be fitted with either a water softener or a filter cartridge to give you clean, clear water for washing your vehicle. Spot-Free Water De-Ionizer Cartridge (not included) - This cartridge neutralizes calcium and magnesium in the water, thereby eliminating hard water. Your car shampoo will lather better and your vehicle will be free of those nasty water spots. 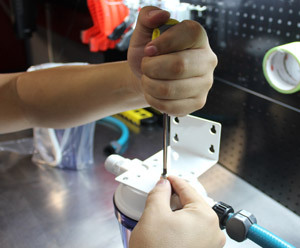 This cartridge can be renewed and reused indefinitely. 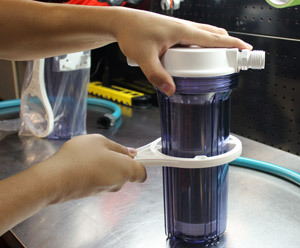 The Spot Free Water De-Ionizer Canister is made of durable plastic with hose-adapter fittings already installed on the unit. You will need one hose to deliver incoming water and one hose to take the water from the filter to its final destination (your vehicle). If hard water is preventing you from achieving the perfect finish, invest in your paint's future with the Spot Free Water De-Ionizer Canister. With the Spot Free Water De-Ionizer Canister, you can eliminate minerals and sediment in your water to render a spotless shine with every wash.